Get out scarfs, dig out the big socks; whether we like it or not Britain’s winter season has reared its ugly head, and it’s here to stay! The only good thing about the cold and wet, however, is the guilt-free opportunity to enjoy the comfort food we crave. 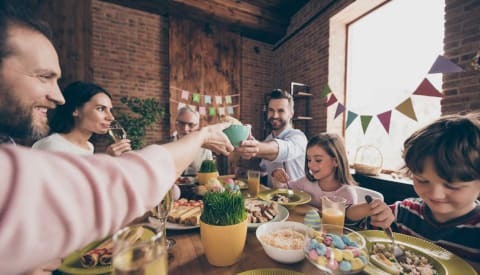 For those of us who are vegan, we know that cooking up those traditional winter warmers we’ve come to know as synonymous with bad weather means becoming a little bit more inventive. That’s why this month we’ve turned our attention to outlining some of the most comforting vegan winter warmers we have in our recipe roster. Risotto is such a hearty dish, that is always packed with flavour. It’s the perfect dish for vegans to be able to enjoy while still getting they’re comfort food fix. 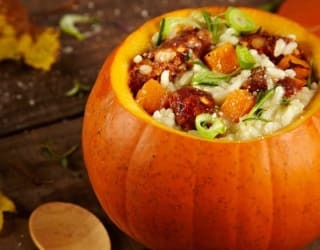 Our pumpkin risotto with vegan sausages is delicious chunks of pumpkin nestled amongst tender risotto rice, teamed up with our lightly spiced vegan wholefood sausages and infused with rosemary and thyme. A real autumnal treat! 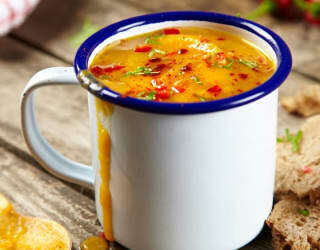 Soup is such a winter staple that it couldn’t not make our top list of comforting vegetarian and vegan winter warmers. But did you know that vegans can enjoy a delicious soup with a creamy and thick texture without adding cream? All you need to do is add tofu to your soup recipes and you’ve got yourself a warm, satisfying (not to mention tasty) winter soup. This recipe only takes ten minutes to prep and 30 to cook, so it’s perfect to cook in bulk for lunches throughout the cold periods. 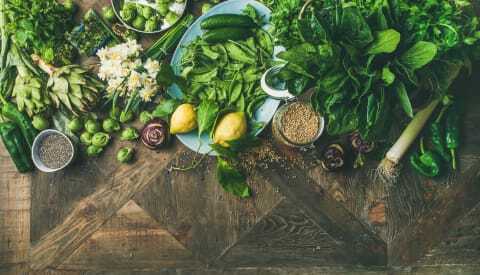 Mediterranean flavours aren’t just for summer, their rich ingredients often lend themselves very well to food that is comforting. 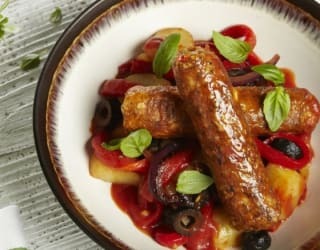 Our vegan stew packs a punch with our Cauldron vegan sausages, black olives, cherry tomatoes, roasted peppers and basil. Another easy recipe, this just takes 20 minutes to cook and is bound to turn even the olive-hater into a convert! A curry was always going to make it onto our list of comforting foods! This tofu saag jalfrezi is the perfect example of a winter warmer and, what’s even better, is that it’s ideal for vegans. 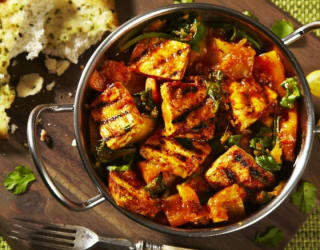 The tofu has a zesty citrus marinade and is chargrilled alongside a hot and delicious jalfrezi sauce. If you’re after more curries for winter warmers, why not check out our Ultimate Vegetarian & Vegan Curry Guide? You know from the name ‘Mexican celebration peppers’ that this is a dish that doesn’t skimp on the good stuff! 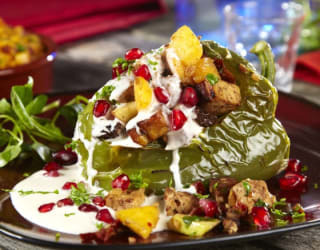 A take on the Mexican national dish, Chiles en Nogada (which usually consists of poblano chillies filled with picadillo, a mixture of shredded meant, fruits and spices) this recipe is perfect for vegans as it uses marinated tofu and a host of other ingredients. Paella is originally a dish from Valencia with ancient roots, and is widely considered to be the national dish of Spain. 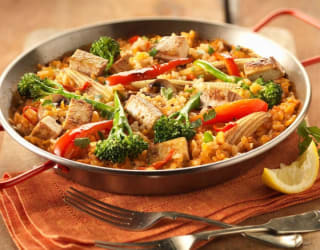 As the traditional paella recipe normally consists of meat and/or seafood, our recipe is perhaps better named “arroz con cosas” (rice with things) as it doesn’t contain any of these things and is perfect for vegans! Instead we’ve packed it with flavour that still holds onto the authentic Spanish taste. 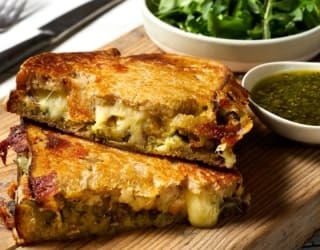 Is there anything more comforting than a cheese and pesto toastie?! No, we didn’t think so. This cheese and pesto toastie is packed full of decadence, but we’ve even added falafel, to give this favourite even more of a punch. The toast is buttered, filled with two types of cheese – cheddar and mozzarella – and topped off with homemade pesto. If you’re looking for an easy winter warmer that is bound to cheer the family up on a rainy afternoon, look no further. Sausage and yorkshire pudding, a classic comfort combination. Toad in the hole takes it to a whole new winter warmer level though, while also being easy and extremely economical! Cook with rosemary and red onions and serve with your favourite green veggies and lashings of meat-free gravy; you’ve got yourself the perfect bad-weather comfort food. It only takes 5 minutes to prep and 35 to cook so you can cuddle up by the fire asap! 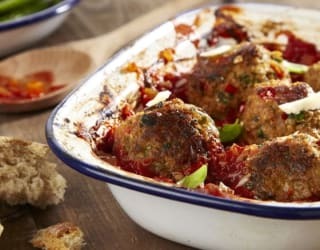 Did you know that you can turn vegetarian sausages into an incredibly tasty meatball? All you have to do is blitz them with a food processor, add fresh herbs, cheese and crumb and ball into little meat-free ball goodness. To make this a classic comfort food, this recipe is served with a traditional tomato sauce. You can either pair it with spaghetti or just east with a delicious crusty bread for something a little simpler and quicker. 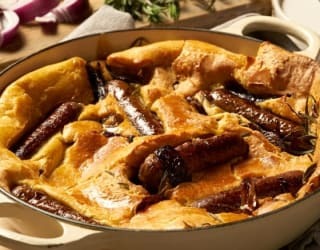 A recipe that utilises cheese, leeks, cider and sausages has to be up there on a list of ‘most comforting foods’ and when all of those ingredients are incorporated into a pie – even better! 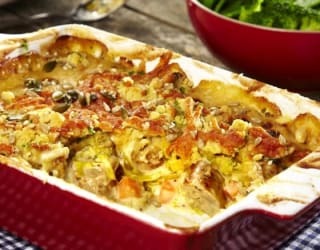 Our West Country pie with Lincolnshire sausages is a hearty meal that will see you through even the coldest winter. Although easy to prepare, this dish can take an hour to cook, so make sure you have a feel good film on in the background! 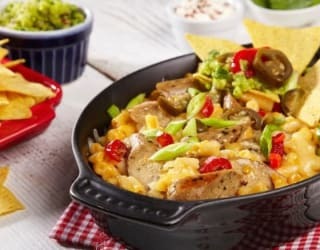 Mac and cheese is bound to put a smile on most people’s faces, but our pimped up South West USA vegetarian mac and cheese is one that will cheer us even the non-believer. This dish is the ultimate comfort food and crowd pleaser, it has a twist of chipotle chilli and guacamole to warm the heart and soul on a cold winter evening. It’s also perfect if you’re entertaining as, when paired with tortilla chips, it can work as an indulgent alternative to nachos. This dish balances warming spices and sweet jaggery – a rich, dark, cane sugar – with zesty, fresh ginger to coat and glazed Cauldron Cumberland Sausages for the ultimate winter warmer. 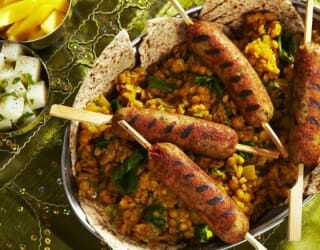 This is served with a spicy dhal and cooling Kashmir potato salad and served with pitta bread for the authentic Indian experience. It’s the perfect filling but healthy vegetarian winter warmer.